Here are a few more color options - since we are using so many overlays here it does limit our options somewhat but I think all of these will look really great and maintain the overall atmosphere of the piece. Also knocked out the dates so the stand out more! 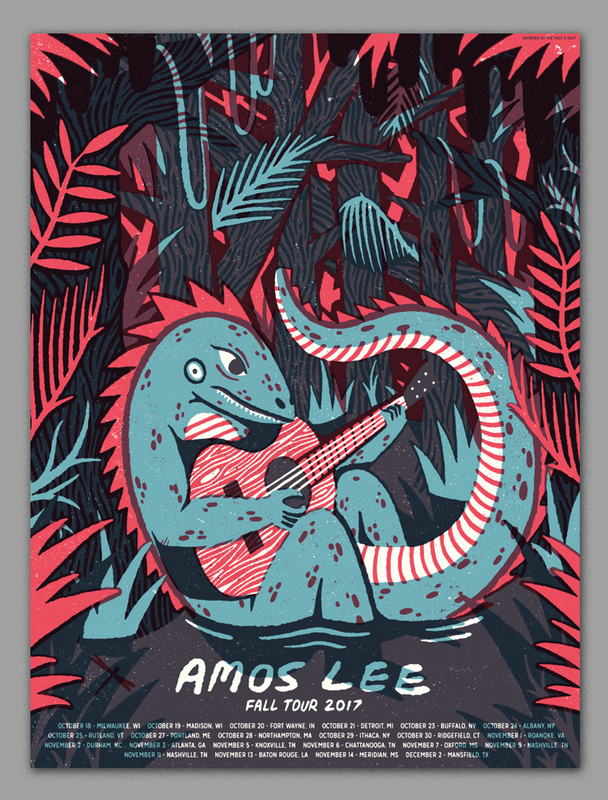 Here is the final art for the amos poster - tried to go for something a little loose and folksy, but still graphic and bold. I think these are going to look awesome in person when you can really see/feel the way the transparent inks overlap. Here are few different ideas for the tour poster, all of these could be cool with some darker, moody autum-inspired color schemes. A nature-inspired mandala made up of leaves, feathers, flowers, insects, & wildlife. All of the relevant info would be in a cool badge-style type treatment in the center. This direction has tons of opportunity for some nice subtle details and textures. A sun rising (or setting) over a a dense forest. I would like to do this one in a collage-style with each tree being made up of a different texture or photo or color. From a distance it would be a nice nature illustration using fall colors, but when you looked closer you could see tons of different little images making up the whole. Theres a local legend around here about a lizard man and I always thought it could be a fun inspiration for a poster. A mysterious lizard humanoid creature chilling in a swamp plucking on a six-string. This could look great with some nice chunky textures and maybe a bit of a looser vintage-inspired drawing style with big bold blocks of color and texture.